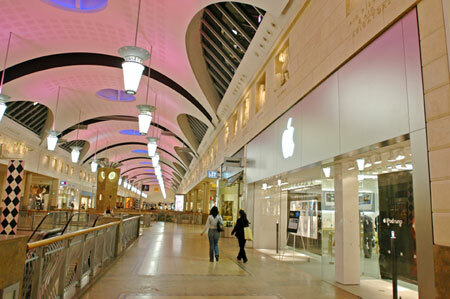 One of the largest shopping centres in Europe has been provided with comprehensive Voice Alarm and Public Address announcement facilities using the existing cabling infrastructure and loudspeaker networks. The purpose of the Public Address/Voice Alarm (PA/VA) system is to provide intelligible speech information and messages to public and staff areas of the centre on a selectable zone basis. The system is configured so that different announcements can be simultaneously made to different areas. In addition, several different sources of background music or other audio programme material are able to be selected and simultaneously broadcast to different zones. The PA/VA system forms part of the fire detection and alarm system and is therefore designed to meet the relevant standards and requirements relating to both Fire Alarms (BS5839) and Emergency Sound Systems (BSEN60849). The system is based on a network of distributed amplifiers/equipment racks. Announcements are made from a number of locations and from a number of different sources. These include a microphone console located in the security control room and emergency firemans microphones located in the security control room and on-site police station. The project designed by B L Acoustics Ltd has replaced the front end control and enabled remote access and touchscreen controls. Each remote rack broadcasts to multiple circuits in multiple zones which have been grouped into usable announcement areas. There are 15 PAVA areas and a further 5 VA only areas. PAVA areas have the ability to have music and CIS messages routed to them. At the heart of the system is a site-wide fibre network that connects multiple Bosch Praesidio units to form a flexible audio matrix. The central control rack handles all the audio inputs of the system which are distributed through the network to the remote racks where Bosch audio output units feed the audio to the existing amplification. The system also uses 2 Ateis UAPg2 units, each of which allows for 8 inputs and 8 outputs. The units are linked to create a 16in x 16out audio processor. These processors control all the non-emergency audio control and routing of music and messaging. They are controlled over IP using the touch screen control system. Both the Bosch and ATEIS equipment is controlled over IP from a touch screen control system. The control system is implemented using common IT equipment, and consists of a PC mounted in a 1U rack chassis, a rack mounted 19” touchscreen monitor and an ethernet switch. The software is implemented using Stardraw Control. Its open-architecture design means that it maximizes flexibility and minimizes costs.